Northern Nevada Correctional Center is located in Carson City Nevada. It is a medium custody prison that can house 1,619 inmates. Offenders are housed in one of ten housing units and can receive on-site medical and mental health treatment. Northern Nevada Correctional Center is part of the prison industries program that manufactures a variety of products in an upholstery shop, paint shop, wood shop, and metal shop. Offenders who work in these shops can earn a menial wage while incarcerated. Offenders at Northern Nevada Correctional Center can participate in the OASIS substance abuse treatment which is an intensive 9-12 month program. Inmates can also receive vocational training in automotive repair, dry cleaning and computer technology. Additionally, offenders can earn a GED, learn to read, and take college classes offered through Western Nevada Community College. 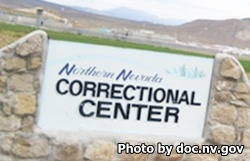 Anyone wishing to visit an inmate at Northern Nevada Correctional Center is required to fill out a visitors application and have it approved before they can visit. Visits are restricted to three hours in duration if overcrowding occurs. General Population inmates have visiting on Fridays and Saturdays from 8am-2pm. Visitors must sign in prior to 8am for the morning visit and by 12pm for the afternoon visit. You can arrive at the facility as early as 7:30am. Stewart Conservation Camp has visiting on Sundays 8am-2pm, visitors must sign in by 8am for the morning visit and 12pm for the afternoon visit. Units 7A, 7B, and 8B have visiting by appointment only on Mondays from 11am-2pm. Visitors must register and sign in by 10:45am. Unit 8A has visiting by appointment only on Mondays from 11am-2pm, visitors must sign in before 10:45am.